We are a well coordinated group of three having a combined experience of over a century in consciousness research, technology and application. Our names are Caspar de Rijk, Claudia Moser and Magdalena Moser. Caspar de Rijk has been professionally engaged in spiritual counseling and life coaching for over forty years. He studied psychology at Utrecht University in the late sixties and he soon found out that with the stress on behaviorism the spirit had disappeared out of the subject. In the search for truth that followed he encountered Yoga masters, Indian mystics, Tarot card readers and several wise men. He did various forms of meditation and spent some time with Krishnamurti in England. He was about to be initiated on a Satsang with his Holiness Maharaj Sharan Singh when he met a high caliber scientologist and got involved in the first Scientology group in the Netherlands. He later became the executive director of the Scientology Foundation in Amsterdam. He subsequently moved to Denmark and plunged into a wild adventure called the Sea Organization which started on a Panamanian registered Steam Yacht, named the Athena. He obtained the highest qualifications as a counselor and supervisor. Delivering counseling in English, German, French, Italian, Dutch and Spanish he became well known among many truth seekers from those countries. Working with people from all walks of life and backgrounds gave him tremendous insights into the mind and consciousness structures. After more than two decades he had learnt and seen enough and began to realize that the whole ‘idealistic enterprise’ had gone off the rails. He left and did a final attempt to reform the church by posting 95 reform theses, Lutheran style, on the wall of the Amsterdam church, an event which was covered on national TV. He was then promptly ex-communicated and lost all contact with his ex-wife and two daughters. Caspar, spent a few years working for a management consulting agency in the late nineties. He left the world of business management in 2003 to open a private counseling practice, the first years in the Netherlands and later in Germany, where he still lives. It was in these years he continued his study of spiritual psychology and basic philosophy while researching the mind and spirit and paranormal phenomena. This research was intensified in the last few years after teaming up with co-researcher Claudia Moser. Using a multi disciplinary approach they reviewed the literature and undertook their own research in order to find the most simple and sound method to create more harmonious lives. This culminated in the Universal Imagination Processing Technique and what they now call MGT Consciousness Technology, which was published in book form in 2015 under the title 'The Self-Explorer's Handbook’. 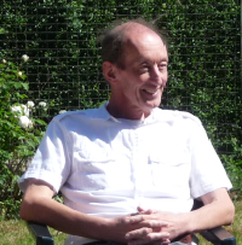 Caspar de Rijk is actively engaged in his life time occupation of exploring, counseling and supervising the consciousness technology applications, provided by the MGT Institute for Consciousness Exploration in Germany and now also in Vienna, Austria. The executive director, Claudia Moser immediately embraced the concept of Multi Genius Technology for Consciousness and considers that we are unifying here the methods and realizations of our spiritual paths thus far. In recent years she says her main interest was the technology of what we called Spiritologie as the procedure is based on the idea that a being is in essence infinity and can rehabilitate this through processing its modes of consciousness. Intensive practice over several years brought the realization that it is not the technology itself but in the end always the decision of a spiritual being that brings out the truth and resolution. Claudia has a bachelors degree in history from the University of Vienna, she completed a professional study in Documentation and Information Technology (library, archives and culture) as well as an intensive research on the subject of beingness. She thought at that time that the best place for this subject would be the Sea Organization of the Church of Scientology, which she joined 1982 and found out soon that the high ethical standards and love for truth reputed in the early days where no longer in evidence and therefore left again 1983. She studied L.R. Hubbard's philosophy, administrative technology and applications until the level known as OT III, she completed Robertson's Excalibur level and did the complete theoretical and practical training of Andreas Buttler's Spiritologie, including the Absolute Zero rundown and the Spiritologie professional internship. Since 2005 she was leading the Spiritologie Center in Austria and is presently involved in the research and development of the Multi Genius Technology for Consciousness methodology. She is full time engaged in running the growing group in Vienna and is the technical director at the international center in Biere, Germany. 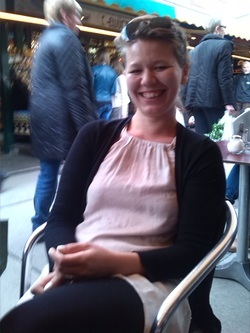 Magdalena Moser, is our all round manager and director of MGT Concepts Publications, our self-publishing platform. She is from Vienna, Austria and was acquainted with Scientology in the so called Free Zone between 1998 - 2004. She did all the Spiritologie levels and training in the following years and has completed the “Pan Determination Rundown”. From 2006 - 2010 she studied “city and regional planning” at the Technical University of Vienna and in 2010 she also studied German philology at the University of Vienna. In April 2011 Magdalena moved to Bigera Haus in Biere, the international seat of MGT Institute for Consciousness Exploration. There she took the position of the General Manager and Director of the Publication Department. Besides that she is also the Chef de Cuisine of the center and has been a contributor to the MGT for Consciousness concept. As our publisher she is responsible for the graphic designs and all the publications of the institute. Right now Magdalena trains also as a professional MGT course guide.